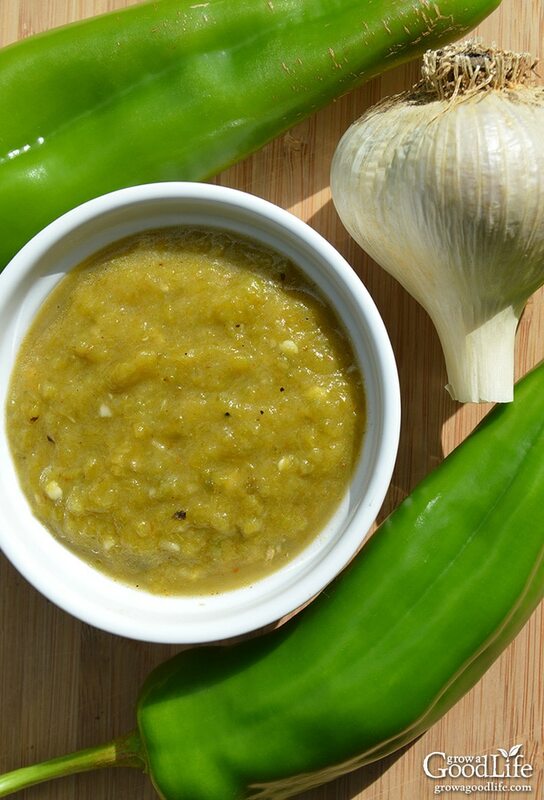 This roasted green chile sauce pairs perfectly with Mexican inspired dishes, including burritos, enchiladas, tamales, and more. Although my garden is located far away from the traditional foods grown in the Southwest, I love the spicy flavors of Tex-Mex foods and can’t resist experimenting with growing different types of peppers. I am a wimp when it comes to hot peppers, and find the mild, sweet heat of Anaheim type chiles a good foundation to most Mexican inspired dishes. It is easy to turn up the heat a bit by adding a jalapeño or two. Growing peppers in cold climates can be challenging, but it can be done if transplants are started early indoors under lights. The pepper plants are transplanted in the garden when the weather warms, and they have a small window available to produce and ripen fruit before our growing season ends. 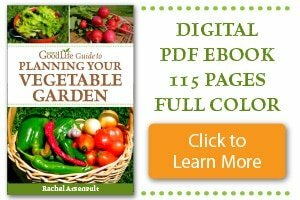 See 10 Tips to Growing Peppers in Colder Climates for more growing tips. With such a short growing season here in Maine, we often run out of warm weather before the peppers ripen completely. Usually, a frost warning has me scrambling to harvest all the peppers left on the plants, leaving me with a whole pile of green peppers at the end of the season to preserve. 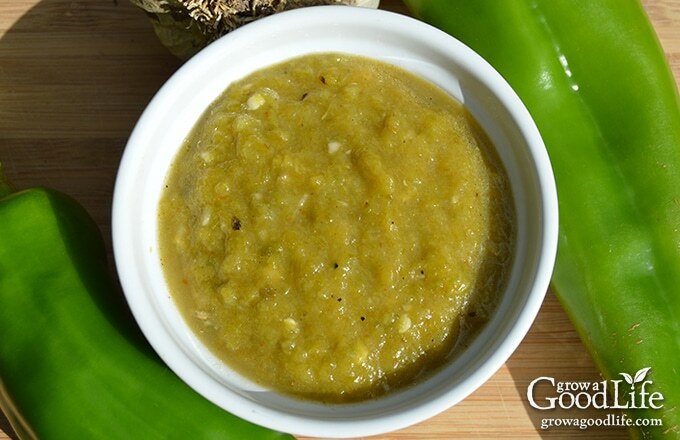 I use several different methods of preserving peppers, but the majority of the green Anaheim type peppers are made into this delicious roasted green chile sauce and frozen for use throughout the year. 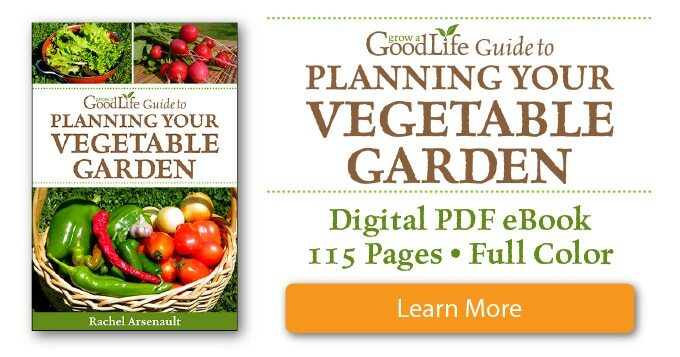 A version of this recipe was shared by a fellow garden blogger many years ago, and it quickly became a favorite. How to Roast and Peel Peppers: The skins of Anaheim, Hatch, and other New Mexico type peppers are tough. Roasting the peppers not only enhances the flavor, but it allows you to blister and remove the thick skin. Visit this link for a step-by-step tutorial on How to Roast and Peel Peppers or watch the video below. 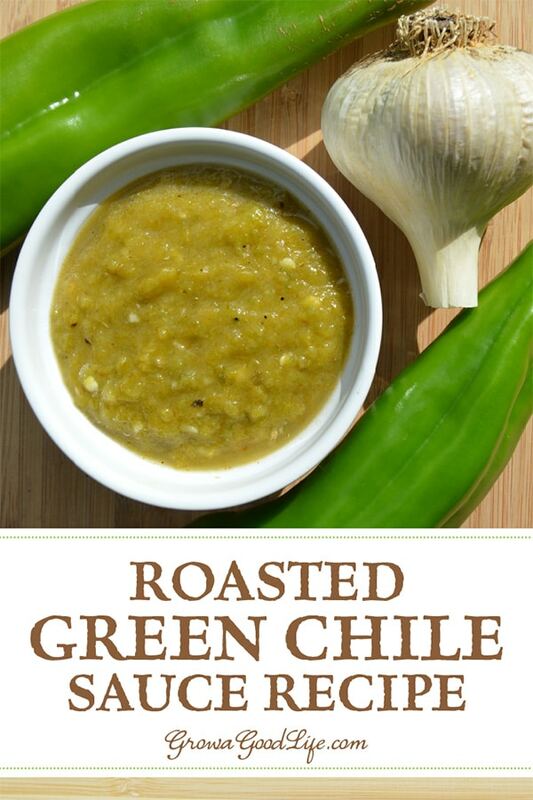 You can also use canned green chile peppers. Substitute about 32 ounces of diced green chiles for the fresh peppers. Roast the peppers and remove skins, seeds, and membrane from the Anaheim. Keep jalapeño seeds for some extra heat (optional). Give the peppers a rough chop and add to a blender or food processor. Add the remaining ingredients to the blender or food processor and process until smooth. Makes about 2 1/2 cups. Use immediately, store in the refrigerator for 2-3 days, or freeze for up to 9 months. 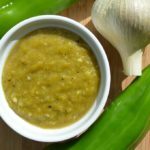 verde salsa be ok to use as a substitute? Joy, You can substitute canned green chile peppers for the fresh. You will need about 32 ounces of diced green chiles. Great recipe! I have a ton of roasted Anaheim peppers in the freezer (and more to come!) so I’ll be bookmarking this recipe to try over the winter.